Lech and Zurs are located in the famed Arlberg ski region, north of St Anton and Stuben in Austria’s Vorarlberg. 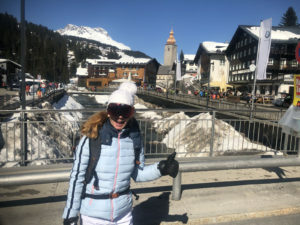 This is Austria’s largest ski resort with connection to St Anton and Stuben, Warth-Schröcken ski resorts as well – a total of over 300 kilometers of prepared (groomed) trails served by 88 lifts. The village valley of Lech is so pretty with the Lech River cascading through the alpine village, chalets and church spires. 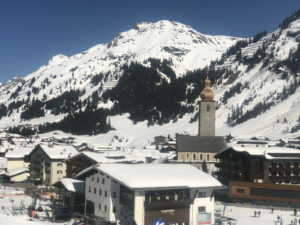 Lech is the upscale place to stay for a family ski vacation with four and five star Austrian ski chalet hotels and chic ski shops like Strolz, and convenient ski lifts to take you up to the surrounding ski slopes. Start on the Rufikopf Tram from Lech village for pleasant skiing. From here, the Hexenboden chairlift offers more excellent prepared slopes toward the charming village of Zurs which has 8 more chairs and trams. Families will love the extensive high alpine terrain of Zurs from groomed (prepared) cruisers to steep, challenging chutes off the Trittkopf tram for advanced skiers. 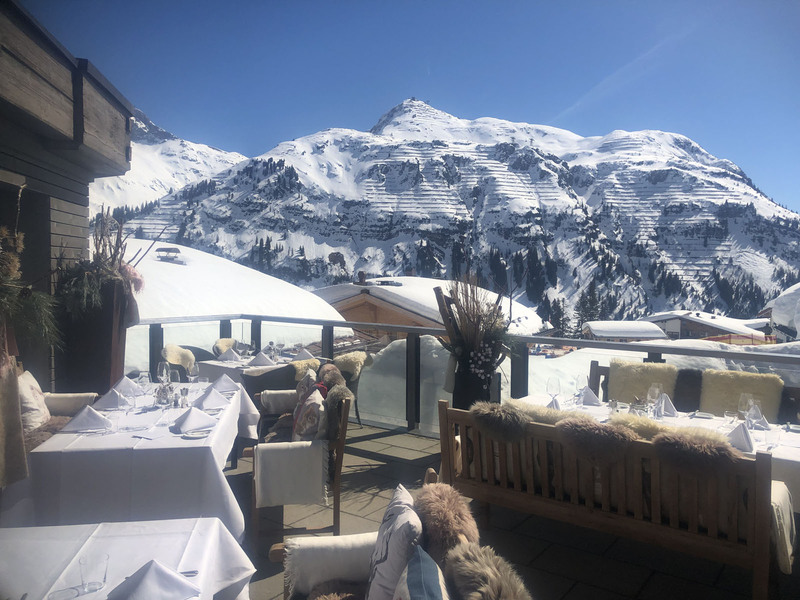 We recommend lunch at Rud Alpe overlooking Lech, or in OBerlech at Bergkristall, or along Muggengrat-Tali (Trail 10) at the quaint Flexenhausl where traditional Austrian dishes are served in a cozy atmosphere. Lech’s 8,000’ summit of Madloch-Joch provides more long runs down to the Village of Zug, where you load a double chair to the mountain top Balmalp. This lodge offers magnificent views, a big sun deck, and a modern interior. The kids will like the mini-gondola operating in the ceiling rafters. From here you can ski down to the 8 passenger Steinmahder bubble chair and enjoy heated leather seats between long ski runs off Zuger Hochlicht. Skiing toward the east brings you to the main base of Lech Oberlech which features more lifts accessing fabulous skiing. Your Ski Arlberg ticket includes a total of 88 lifts from Lech Zurs and Warth Schroken to nearby St Anton, Stuben, St Christoph, and over 305 kilometers of trails plus tons of off-piste skiing. If you wish to ski off-piste, it is best to hire a guide, Bergfuehrer, who will lead you safely (avalanche danger is real) to the best snow. Guides are expensive ($500 Euro a day) but a worthwhile investment to open up extensive backcountry terrain comparable to what you would experience heli-skiing or cat-skiing. Lech and Zurs have excellent ski schools, Kinderclub for the youngest, and special après ski sports for families like a sledding, climbing wall, tobogganing and snowtubing, even horse drawn sleigh rides. 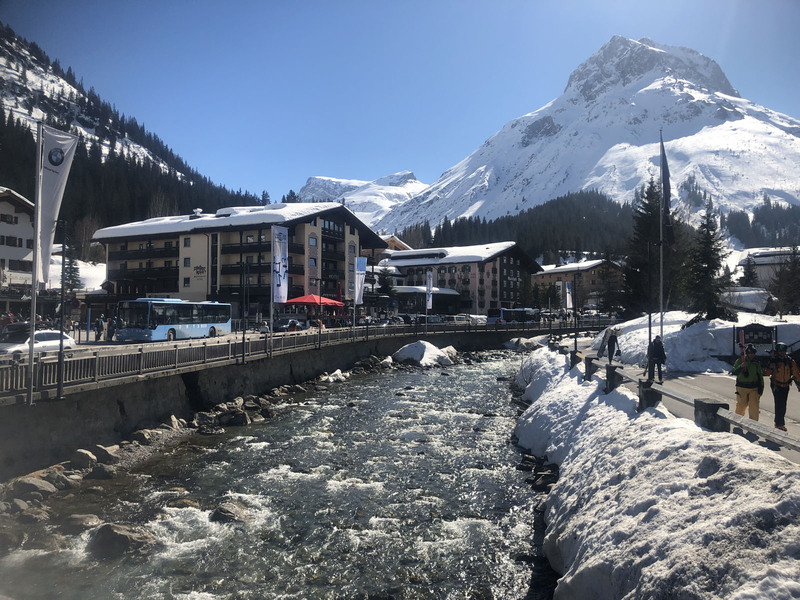 Lech Village is delightful, families have lots of upscale shops, restaurants and of course great après ski bars along the Lech River with views of the slopes. Lech has many beautiful five star and four star hotels, like Hotel der Berghof located right next to the Seilbahn Rufikopf Tram, with ski packages perfect for families. Garni means breakfast is included. Oberlech is a very romantic on mountain village accessed by Tram only with several on mountain chalet hotels if you want a quieter car-free stay. Also, Oberlech is a great spot to stop for après ski or a ski in lunch with a short ski back to the village of Lech. Stop at the fancy Hotel Bergkristall for a fantastic ski in ski out lunch at this beautiufl alpine setting. Lech Zurs sister ski resorts are Beaver Creek, Colorado, and Hakuba Happo in Japan. Der Berghof Hotel – A 4-Star hotel in Lech Village just an elevator ride and steps to the Gondola and Lech skiing. This traditional alpine chalet der Berghof Lech offers beautiful rooms, many with balcony, fine dining and breakfast buffet, Bergquell Spa, and ski room. 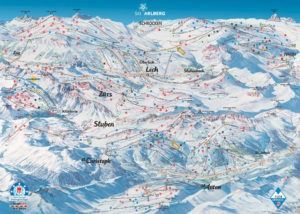 Lech Zurs Ski Stats: 8,038-feet summit, 190 kilometers of prepared trails served by 47 lifts plus thousands of acres of off-piste, 3,200-feet vertical at Lech Zurs Oberlech and Warth Schroken skiing consists of 10 peaks of 8,000-feet. 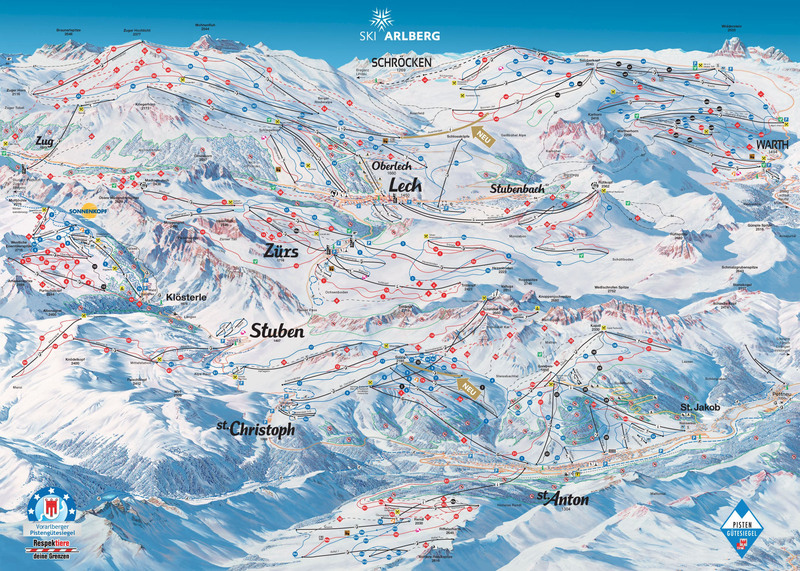 Part of Ski Arlberg Card along with nearby St Anton, Stuben, St Christoph, Warth. skiers have over 300 kilometers and 88 lifts.